Adding 20 new factors, a whole new category on behavior and decisions, and research on unexpected things that impact blood sugar and diabetes. A printable, colorful PDF version of this article can be found here. Ever heard someone explain diabetes with a frustrating level of simplicity? “You’ll have on-target blood sugars as long as you eat right, exercise, and take your medicine." If only it were that easy, and if only vague advice was all we needed to hear. One of our missions in diaTribe – and in this column – has been to debunk this myth. Of all the topics I’ve covered in Adam’s Corner, one article has resonated with readers more than any other: “How many factors actually affect blood glucose?” Since its publication in 2014, over 400,000 people have viewed that initial list of 22 factors – quadruple the next most-viewed column (Low Carb vs. High Carb). I bring this up because it’s the 150th issue of diaTribe, and I’ve often thought about what I would add to that list of 22 factors if I were to revisit the article – especially given all I’ve learned since then from so many people with diabetes, healthcare providers, and scientists. This article expands on the original – sharing 20 additional factors and a whole new category of factors to consider. See the complete list of 42 factors below, followed by descriptions of the new additions. 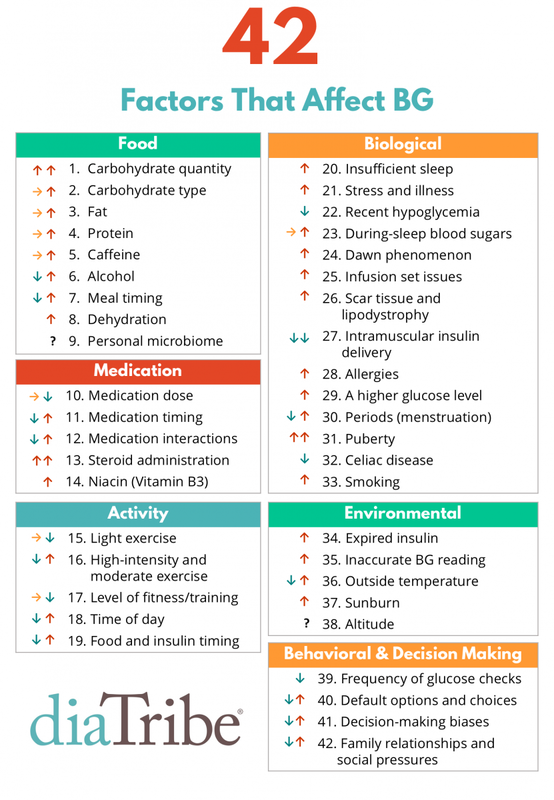 I know what you’re thinking – 42 factors that affect blood glucose? Are you kidding?! Yes, it is indeed daunting, but I also hope it’s a reminder of what each of us takes on daily: A LOT! Plus, this list reveals many levers we can pull when trying to improve. For my toolkit to manage some of this madness, get Bright Spots & Landmines as a free PDF (or name your own price) or at Amazon for $2-$6. The arrows above show the general effect these factors seem to have on blood glucose based on: (i) my own experience; (ii) available research; and (iii) what I’ve learned from others with diabetes. A sideways arrow indicates a neutral effect. Not every individual will respond in the same way (and even within the same person, you may be different from day-to-day or over time). Certain factors may also apply more to type 1 vs. type 2 diabetes (or the other way around). Factors with up and down arrows are of course the most challenging - they may increase blood glucose or decrease it. The best way to see how a factor affects you is through personal experience – check your blood glucose more often or wear CGM and look for patterns. Carb type: ratio of fiber to total carbs, sugar to total carbs, and liquid vs. solid. When we published the original 22 factors piece, we only mentioned “carbohydrates” in the food category. But it should be two factors in one: the number of carbs AND the type of carbs. As I’ve written before, not all carbs are created equal. My personal major sources of carbs – green veggies, nuts, seeds, chia pudding, low-carb/high-fiber tortillas, Quest Bars, berries – tend to have 50%-80% of the carbs from fiber and very low sugar. For example, a serving of chia pudding has 20 grams of carbs, with 16 grams from fiber. Foods with a high fiber to total carbs ratio have a lower impact on my blood glucose versus foods with the same amount of total carbs and no fiber. In addition, the more grams of carbs that come from sugar, the higher the impact on blood glucose ­- even if total carbs are the same. Last, format also matters so much – liquid carbs will usually increase blood glucose more quickly than solid carbs, even if the overall carbs are equal. Meal timing, especially dinner. 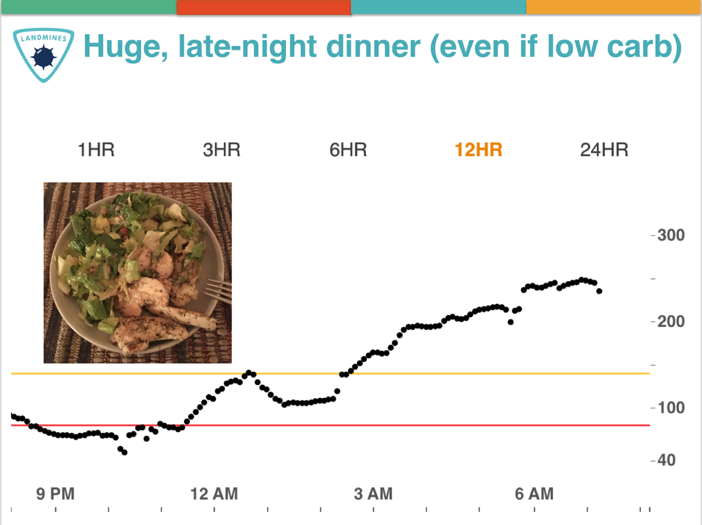 I’ve found eating a large late-night dinner, no matter what’s in it, often results in high overnight blood sugars. The converse is also true: a lighter, earlier dinner seems to improve my overnight numbers. Separately, I’ve also tried intermittent fasting (“time-restricted eating”) more than 35 times now – first meal at 12 noon, last meal at 8pm. Stay tuned for a future column on this topic – this is in no way a recommendation, just noting something new that I’m trying. In short, meal timing is both a Bright Spot and a Landmine, depending on how this factor is implemented. Dehydration. Over the years, several diaTribe readers have emailed sharing that dehydration seems to increase their blood glucose levels. Indeed, in a randomized, controlled 2001 study, dehydration did raise blood glucose levels for those in a fasted state. The New York Times also reported in 2012 that dehydration increases levels of the hormone vasopressin, which pushes the liver to produce blood sugar – their headline was that drinking water can reduce the risk of diabetes! Luckily, it’s becoming easier and easier to find water, so this is a great way to be proactive. Personal microbiome (gut bacteria)? There is a lot of ongoing research on the impact of gut bacteria (“microbiome”) on blood glucose levels and insulin sensitivity. 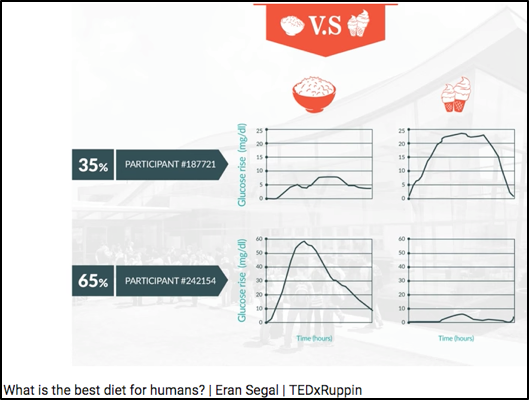 Dr. Eran Segal’s lab at the Weizmann Institute has done some compelling work on this topic with CGM and microbiome data, summarized in this TED talk: What is the best diet for humans? They have published a number of high profile papers, including one on how gut bacteria predicts an individual’s glucose response to bread (Cell Metabolism 2017), another on personalized nutrition with CGM and microbiome data (Cell 2015), and a third on how artificial sweeteners affect the microbiome and glucose responses (Nature 2014). Steroid administration (e.g., prednisone). Our original 22 factors piece called out “medication interactions,” which technically would include steroids. But after many frustrated diaTribe reader messages on this topic, I really wanted to call this one out separately – it’s critical! Steroids like prednisone can significantly increase blood glucose levels, in part by telling the liver to increase glucose production. This Joslin article reports that once prednisone is stopped, blood glucose levels usually return to normal fairly quickly. Niacin (Vitamin B3). Another factor I learned from diaTribe readers, and indeed, studies show niacin does increase blood glucose levels modestly. Niacin is typically prescribed to improve blood lipid levels, including HDL cholesterol and triglycerides (i.e., to improve heart health). According to a Medscape article (based on a 2005 study), the increased blood glucose levels seen with niacin did not translate into worse heart outcomes. Still, this is another factor to keep in mind if your glucose levels are higher than expected. Level of fitness/training. Back when I started cycling in 2011, I would see dramatic drops in blood glucose. 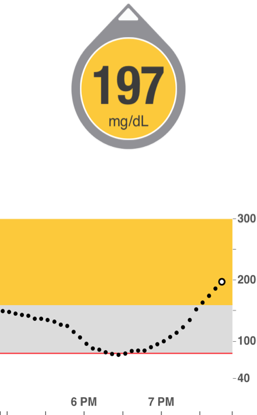 Now that I’m more accustomed to it, I see smaller glucose drops for the same amount of time cycling. This factor is especially important for someone starting a new activity (or starting any exercise); you may see profound blood glucose drops initially, which may get smaller over time as level of fitness improves. Time of day. I find morning exercise causes a smaller drop in blood glucose, at least relative to other times of day. I tend to be more insulin resistant in the morning, which could explain the effect. Kelly (diaTribe’s Editor-in-Chief) is the opposite and is much more insulin sensitive in the morning! Your mileage may vary, and understanding more about your morning sensitivity is especially possible through CGM. Food and insulin timing before exercise. Though this factor is also captured in others, it’s critical to call out in the exercise category – even with the exact same exercise on two identical days, how I time my food and insulin makes an enormous difference on post-exercise blood glucose. I discuss three big timing mistakes in Bright Spots & Landmines, and the one shown at right is a common one: eating too close to starting exercise, which can cause low glucose during activity (food has not been absorbed) followed by a significant high afterwards. The other two insulin-related mistakes, not reducing bolus insulin enough and suspending basal insulin (pump) immediately before activity, are covered in chapter 3 of the book. Recent hypoglycemia. This phenomenon is sometimes called “hypoglycemia begets hypoglycemia.” For instance, if I’ve experienced hypoglycemia in the past 12 hours, I’m more likely to experience hypoglycemia again. One reason for this “vicious cycle,” as explained in a 1993 article by world renowned hypoglycemia expert Dr. Philip Cryer, is that recent hypoglycemia impairs the body’s defense mechanisms against lows. When another low comes up, it’s harder to recognize the symptoms and/or the body has a harder time avoiding it. This was seen in the study testing the MiniMed 530G’s low glucose suspend feature, as well as in at least one CGM study. Overnight blood sugars? My overnight blood sugars seem to have a big impact on my next-day time-in-range (70-140 mg/dl): if I spend all night high – especially over 180 mg/dl, I’m more likely to fight high blood sugars the whole next day. Conversely, when I spend most of the night in range, the next day gets off to a far better start, and I seem to spend more time in range. In the 22 factors article, I talked about the dawn phenomenon (4:00-5:00 AM rise in blood glucose from hormones), but my blood sugars over the course of the entire night sleeping is a distinct factor. Here’s an example from my own data last month that illustrates what I’ve seen: 24-hour time-in-range was just 24% (left) vs. 79% (right). As shown on the left, spending all night high made the next day a challenge. I could not find research on overnight time-in-range driving next-day time-in-range, but my own CGM data has confirmed this time and time again. Intramuscular insulin delivery. Here’s another one for people on insulin! In the previous 22 factors piece, I mentioned two injection/infusion set factors, but this third one is equally relevant. Injecting or pumping insulin into a muscular/low-body-fat area can increase the risk of hypoglycemia – especially if it happens before activity. For instance, when I go for a bike ride, I see a far bigger drop in blood sugar when my pump site is on my leg vs. other locations. My friends on injections have shared similar sentiments. Puberty. High levels of hormones secreted during puberty – growth hormone, testosterone, estrogen, cortisol – can increase insulin resistance. According to some estimates, adolescents with diabetes may need as much as 30%-50% more insulin than adults to keep their numbers within range. JDRF has a valuable teen toolkit with more details. Celiac disease. Untreated celiac, leading to a damaged small intestine, can increase the risk of hypoglycemia because the small intestine may no longer be able to absorb nutrients properly. Beyond Celiac also notes that untreated celiac may contribute to “irregular blood glucose levels.” According to the Celiac Disease Foundation, ~6% of people with type 1 diabetes have celiac, which is six times higher than the general population. There is no established link between type 2 diabetes and celiac disease. Outside temperature (especially for type 2 diabetes)? This is one I’ve heard from diaTribe readers, though most online articles narrowly focus on how hot weather leads to dehydration which leads to high blood glucose. (See the dehydration factor above.) There seems to be more to the story. This scientific review on body temperature regulation in diabetes (2016) summarizes a lot of research (192 citations! ), and I was struck by some evidence that cold exposure can improve insulin sensitivity in type 2 diabetes (“it appears that mild cold exposure may be useful for the management of type 2 diabetes”). Some people with diabetes also report that sitting in the sun drops their blood glucose – this blog post from Columbia’s Dr. Jane K. Dickinson hypothesizes that the blood vessel dilation (expansion) from heat might be responsible (similar to the effect in a hot shower or hot tub). In the comments section, others confirm that cold weather drives their glucose numbers down – perhaps related to the body working harder (shivering) to stay warm. More research is clearly needed, especially to disentangle temperature from other related factors (exercise, hydration, meter accuracy, expired insulin), but there is more than a signal that outdoor temp is an independent biological factor that affects BG. Sunburn. diaTribe readers, along with many sources (CDC, Cleveland Clinic, ADA), note that sunburn stresses the body and can increase blood glucose. I covered “stress/illness” in the previous 22 factors, but sunburn is so common and non-obvious that I wanted to call it out specifically. Frequency of glucose checks. More frequent glucose data ensures I’m driving my diabetes safely and able to steer my blood glucose back onto the road (in range) if I’m going high or low. Plus, glucose data provides useful feedback on what I did well or what I might do differently next time. In studies of both fingersticks and CGM, the more frequently someone obtains a glucose reading, the better they do (time-in-range, hypoglycemia, A1c, etc.) 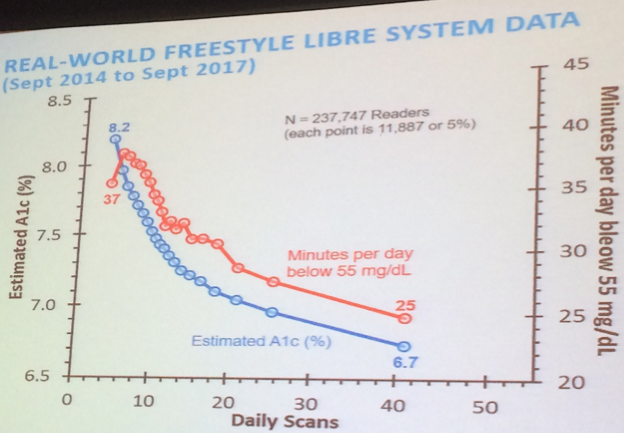 – see the plot that Abbott (Freestyle Libre) shared last year, showing the relationship between frequency of daily glucose checks vs. A1c and hypoglycemia in over 237,000 people. Some might believe that glucose-check frequency is simply a marker of diabetes motivation (correlation), but I personally disagree. Glucose data is a key factor in diabetes decision making and learning. Plate/bowl size: As I noted in Bright Spots & Landmines, the same amount of food on a smaller plate looks more filling – see the image below. This has implications for carb counting and the amount of food eaten at one time. 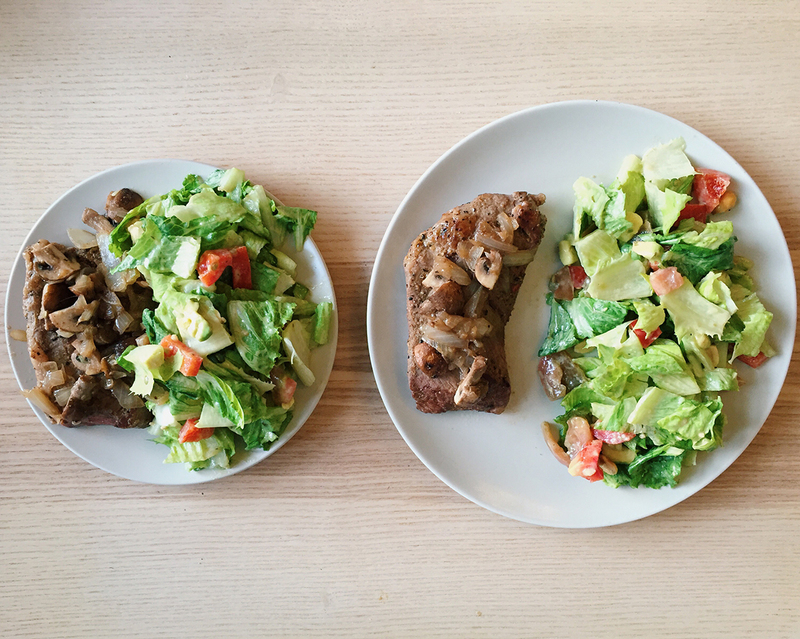 At diaTribe, we recommend switching to 8-inch dinner plates. The same is also true of bowls in my experience – the larger the bowl, the more I will eat. Visual prompts: When there is junk food sitting around – especially if it’s highly visible on the counter – I’m more likely to eat it. When bread is brought to the table at a restaurant, I’m more likely to have a nibble, and then two, and then finish half a loaf. When I store glucose tabs everywhere in my life, I’m far more likely to treat my low with a predictable correction, rather than opening the fridge and binging. In short, the visual prompts in my environment directly impact what I choose, driving big changes in blood glucose. Decision making biases. I think these five biases have an especially notable impact on choices and blood glucose levels – it might sound a bit geeky, but stay with me here! I’m also excited to know what you think on this, so please share comments here. Present bias (Hyperbolic Discounting): When given two similar rewards, most of us prefer the reward that arrives sooner rather than later. Would you prefer $5 right now or $10 in three weeks? This is arguably the biggest challenge in diabetes – it’s easier to prioritize what feels good now (e.g., sugary foods), rather than the longer-term benefits of keeping blood sugars in range. This affects food choices in a huge way, but also motivation to exercise. It’s easy to make the wrong choice – and see resulting high blood sugars – when the feel-good benefits of doing so are immediate. Loss aversion – We tend to prefer avoiding losses rather than acquiring equivalent gains: it's better to not lose $10 than to find $10. Hypoglycemia is the best example of a loss that everyone with diabetes wants to avoid. This can lead to accepting more time with high blood sugars, especially for those without access to CGM or strips. Loss aversion impacts all sorts of diabetes choices, such as what glucose target to aim for (e.g., 150 vs. 100 mg/dl), when to correct a high blood sugar, what blood sugar to go to sleep with, and more. Negativity bias – It’s easier to recall unpleasant memories compared with positive memories. This is the thesis of Bright Spots & Landmines – we all tend to focus on the things going wrong, which puts our focus on mistakes and self-blame. This focus on the negative is sometimes helpful, but can also lead to a lot of guilt, frustration, and depleted motivation. 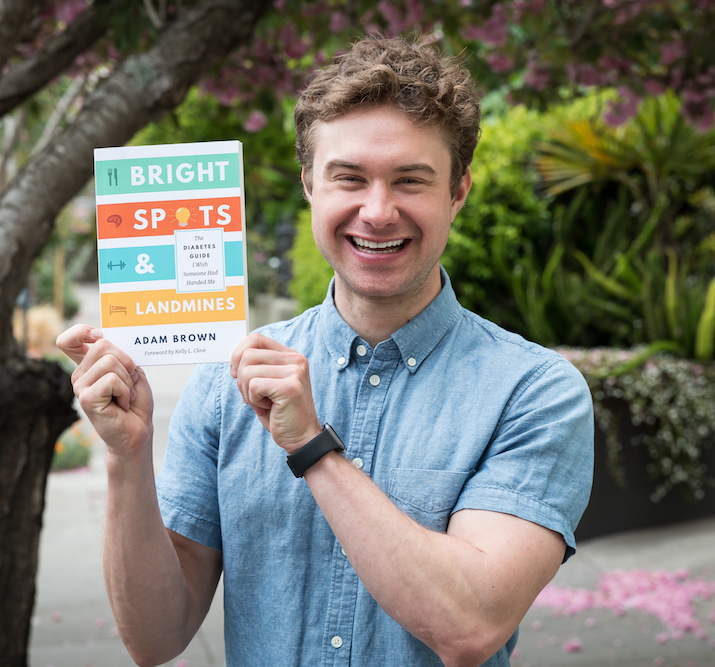 Finding Bright Spots – those things that are working and should be replicated – helps overcome the negativity bias and has had a big positive impact on my blood sugars. Selective matching – People often perceive patterns where none exist. For those with arthritis, this might mean looking for changes in the weather when experiencing increased pain, but paying little attention to the weather when pain is stable. As Dr. Amos Tversky summarized in 1995, “[A] single day of severe pain and extreme weather might sustain a lifetime of belief in a relation between them.” Since there are so many factors that affect blood glucose, it’s easy to draw inaccurate conclusions about cause-and-effect. For instance, the one time I ate ____, my blood sugar stayed in-range – therefore, this is a great food to eat. In reality, I always try to confirm my blood-sugar hypotheses with multiple experiments and tests. Representative bias – When evaluating a situation, the most immediate examples that come to mind often drive the decision – even if those aren’t representative of the real trend. For instance, after one night spent with low blood sugars, I’m often tempted to change my whole insulin regime, even if the previous six nights had no lows. Family relationships/social pressures. At the recent JDRF Mission Summit, psychologist Dr. Weissberg-Benchell pointed out the link between diabetes distress and blood glucose outcomes. Interestingly, she mentioned how high levels of family conflict and family distress are linked to higher A1c’s in kids/teens with diabetes. On this point I’d add social pressures, as I mentioned in a recent column about choosing what to eat at a pizza restaurant. To me, this is another factor worth calling out – a challenging family or social environment can directly impact blood sugars. Did I miss anything in these new factors? What do you agree and/or disagree with? Please send comments here – we learn so much from diaTribe readers! Read the original 22 factors here. “One of the best diabetes books ever!” – Sheila, living with diabetes for 50 years and 5-star Amazon review of Bright Spots & Landmines. If you don’t have a copy yet, get it here for free or name your own price. You can also purchase it in paperback ($6) or on Kindle ($1.99). All proceeds benefit The diaTribe Foundation, a 501(c)(3) non-profit.